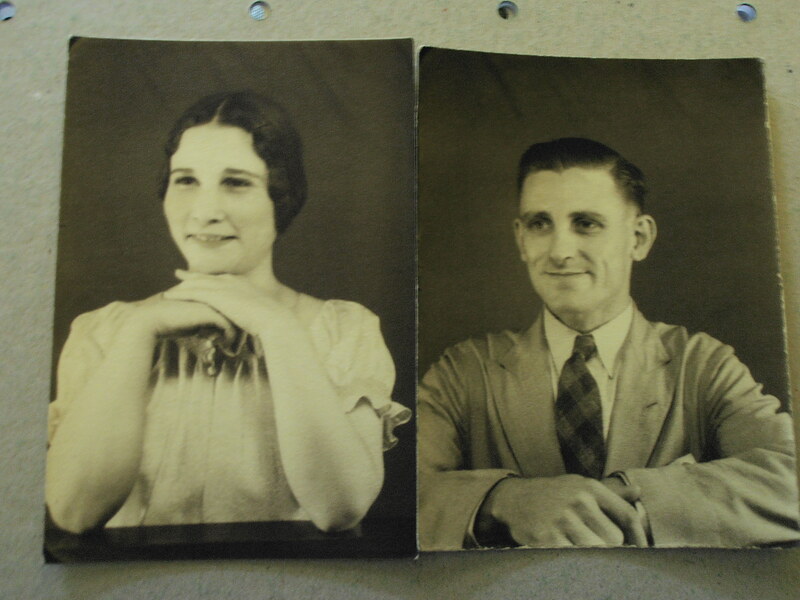 Some time in 1937 Winifred Leonard went to a dance at the Dalhousie club in Calcutta, India with her fiancé. She came away though with his best friend Frederick Watt. 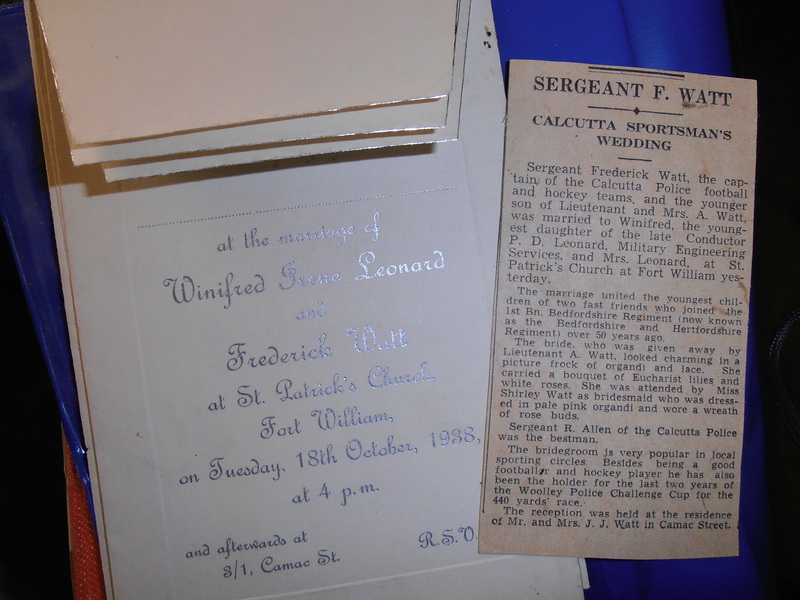 I have no idea how this scandal went down in British Indian society but on Tuesday the 18th October 1938 at 4 pm they were married at St Patrick’s Church, Fort William in Calcutta. They must have known each other before this as the paper cutting describing their wedding stated that “the marriage united the youngest children of two fast friends”. But then, Winifred lived at boarding school in Darjeeling as a child and even taught there herself for many years after graduating and, in 1936, returned to England with her mother for a short period; so they may not have crossed paths much or at all in their youth. Whatever, on the 25th October 1940, just over 2 years later, my mother was born. My Grandparents on my mother’s side were both born in India. My grandfather – Frederick Watt – was born in Multan in November 1905. 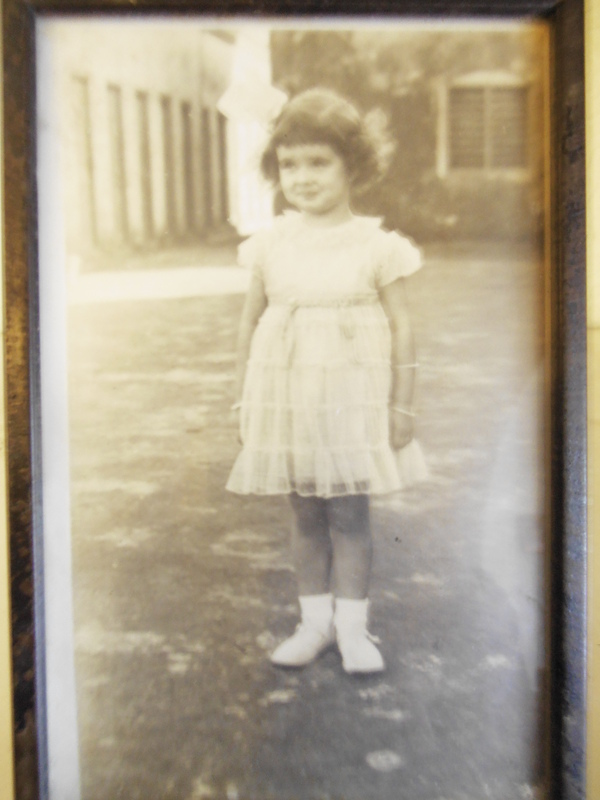 My Grandmother – Winifred Leonard was born in Campelpore in December 1908. Both their parents had joined the 1st Bn. Bedfordshire Regiment sometime before 1888. My grandfather joined the Calcutta police and used to patrol the Howrah bridge searching travellers to the city for contraband goods. My Grandmother was Sister PG (meaning she was one of 3 senior nurses earmarked for becoming matron one day) at the Presidential General Hospital. During the hot summers the British had a habit of leaving the overcrowded city and head for the cooler north. Many would come to Darjeeling and enjoy the coolness of the Himalayan winds. My mother and her parents however, would veer east a little after crossing the Gangees and go to stay with friends in the Bengal Jungle. My mother recalls the place as being called “Ranchee” but I can find no trace of that name. Instead, I suspect that she, as a young child, misheard the pronunciation and actually went to Rajshahi which is in the right area. If that is true, then my mother used to play in the Bengal jungle just a handful of miles away from where I and my family now live and work. I am the first person in our family to come here since my mother and grandparents left India in 1947 and when I visited Calcutta (or Kolkata as it is now) I was the first to trace my family’s footsteps. Everything was still there – Dalhousie,Fort William, the Howrah Bridge (now Rabindranath Bridge). In many ways, both in India and in the Bengal part now known as Bangladesh, not much has changed since those days. I grew up with tales of India but never really took much notice or appreciated just what the adults around me were trying to say. It took living in Bangladesh for 3 years to finally begin to put together just what role the land has played in my life and that of my family’s. I didn’t understand why it was that, when we first came to visit, I found the place to be so naturally comfortable. I felt like I had come home despite never having been here before. When others were talking about how hard they find living there and how they missed their home, I found myself longing to live there. In 3 years since I have rarely missed the UK though there are many things about my birth land that I have come to cherish as a result of living in Bangladesh. One thing I have learned from Bangladeshis is that family matters. Which is why, I am now tracing my roots and sharing what I find with you. Great start to your family history Ken and I’m sure there is a great deal more to uncover. I think your journey into your family history will be a lot more interesting than the ‘celebs’ on the show ” Who am I ” currrently being shown on the Beeb !! Thanks Mick! I do have lots of documentation and still hope to do a tour of India to find out more about my family one day but what I know so far is certainly a fascinating story! What a lovely story, Ken! I am glad you have directed me to this post. I can see you find life so much fulfilling with the choice you have made of living in Bangladesh. The country makes me curious to visit t, and I hope I can do that someday! During the era of East India Company, there were not as many states in India as you see today. The ‘Ranchi’ of today, was a part of the Bengal presidency (http://en.wikipedia.org/wiki/Bengal_Presidency) till 1947 and was then the a hill station and a summer capital during British Rule as it was quite popularly known for the cooler summers (which is definitely not the case today..:)..)…Ranchi was the headquarters of the South-Western Frontier Agency was formed in 1833. Am not sure how your mom would travel around in those days, but there were not many trains connecting the various cities back then. As far as I remember my history, there were probably only 3 routes connecting the whole of western India and there was definitely a ferry ride to cross the Ganges (But I am not sure for which route…You have given me a reason to explore this more, so if I get something I will revert back..). Hey Rishu, thanks for writing. Your comments were fascinating and I would certainly like to hear more from you as you research more! Thank you for your kind words and I hope you enjoy coming again! It certainly sounds like Ranchi is a distinct possibility though it was to stay at the home of a friend in the Bengal Jungle that my mother went with her parents rather than a ‘tourist destination’ as such (for this reason, they didn’t do the climb up to Darjeeling either – though my grandmother grew up there) and my mother’s memory has proven pretty accurate. Only her pronunciation of Bengali words has been flawed but then that is to be expected from a young British girl in an age where culture awareness was hardly considered important. Nevertheless, Ranchi still remains a possibility and I guess we’ll never know for certain! Thanks for commenting – I’d certainly love to visit Ranchi at some point! Fascinating story Ken! Meenakshi is right. I am pretty certain the town you are referring to is Ranchi too. Thanks for writing Madhu. I would be interested to hear why – I’m still not convinced but admit Ranchi could be possibility and I don’t know much about the place – so I’m still open to persuasion! Yes, it certainly sounds right and matches the idea with the jungle but misses the fact my mother travelled north from Calcutta (but Ranchi is WNW) and she crossed the Ganges into the Bengal jungle. You don’t cross the Ganges for Ranchi and it isn’t in Bengal! It’s possible my mother is wrong about this but I was amazed when we went to Kolkata that this 70-year-old’s memory of being 7 or less in a country she hasn’t returned to since 1947 was absolutely 100% spot on! All the roads and places she remembered were there and just as she said they would be. Oh my god, your mother used to to go Ranchi (she has spelt it as Ranchee)… it is close to Calcutta and used to be a hill station then. It is now the capital of Jharkhand, Ken. I grew up in Jamshedpur, a three hour drive from Ranchi. It is still a small dusty town but with a less harsh climate than we are used to in the plains. Indeed, who can tell? I would be interested though if you can put me in the direction of finding these records? Are there any websites that could provide me with information? I am very interested to find out more beyond the resources I have obtained from my mother. Thanks for getting back to me – this is a fascinating subject! You said “In many ways, both in India and in the Bengal part now known as Bangladesh, not much has changed since those days”. In what ways, for example? And what features of Bangladesh life have changed mostly since these times? This is such a wonderful idea… Kind of reminds me of the book “Roots” by Alex Hailey, for which he spent decades tracing his roots to a small tribe in Africa. Looking forward to reading all your posts! Welcome to my blog Sumithra – so glad you could join us and I hope you continue to enjoy reading the posts! Thank you for your kind words, it certainly has been a wonderful adventure finding out more about myself and my family in India. I’m sure the journey isn’t over yet! Such an interesting family background! It takes quite a brave person to do what you are doing, though, no matter the family connections to the place. Thank you. I’m not sure it is bravery – stupidity perhaps?! Thank you for stopping by my blog and liking of the posts. It’s an amazing you are doing in Bangladesh, keep it up. You have a beautiful family. This is an amazing story! I think this is what Oprah would call “coming full circle,” or a “full circle moment” or something like that 🙂 Love it! Now I’ve also gotta research this lot for my teacher. This helps Dad! Thank you very much 🙂 That is such a kind statement to make – even if I can’t claim it is true 🙂 Thank you for commenting – please come again! Yes, to both those questions! We do get to come home once a year or so and we’re currently back in the UK for six months which is nice. But when we’re in Bangladesh we do miss the UK quite a bit. That said, when we’re in the UK we miss Bangladesh so much! I can’t wait to get back there in January! 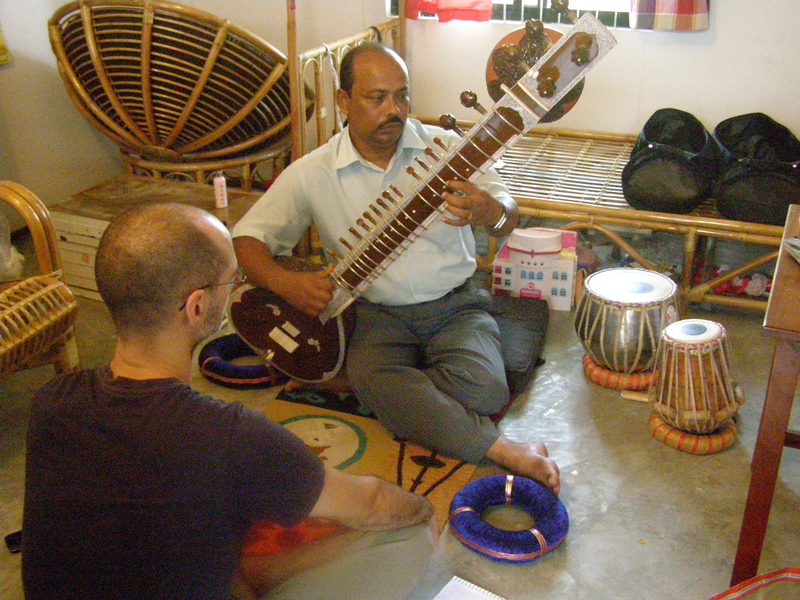 The customs and culture is hard to get used but it is very exciting and we’ve learned so much from Bangladesh culture and people. They have so much to offer the western world – hence why I love to write about my experiences there and share a little of the love I feel for Bangladesh.